The Stifflexible Comic notebooks are made with fun covers that are hard but are able to bend on hinged sections. Each notebook has 192 acid-free ivory pages with 144 lined, 32 blank and 16 that are detachable. The notebooks also offer a pouch on the inside of the back cover and an elastic bookmark. 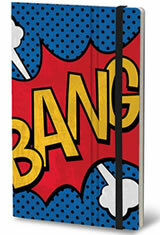 Stifflexible Comic Medium Memo & Notebooks - Bang 2! The Stifflexible Comic Medium Memo & Notebooks usually ships within 1 business day unless otherwise specified. Each Stifflexible Comic Medium Memo & Notebooks we sell is guaranteed to be genuine, authentic and will arrive brand new & unused!